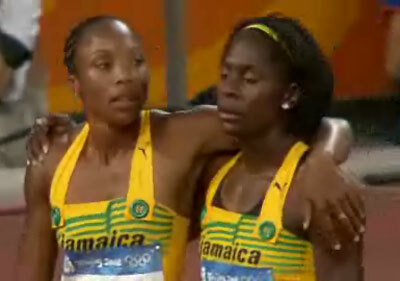 Jamaican athletes console each other after their botched baton change. Disaster struck the hot favourite Jamaican women’s 4X100 meters Olympic relay team which did not finish after a bnotched third leg baton change. The race was won by Russia in a time of 42.31 seconds, followed by Belgium and Nigeria. Russians celebrate victory in disbelief. Jamaica’s Kerron Stewart going without the baton on the third leg. A focused Veronica Campbell-Brown waits in her anchor position before the start.